Well, with the arrival of spring it is the appropriate time now to remove the curtains and permit the natural air to enter your rooms. Spring cleaning is an old tradition and after spending the whole winter remaining confined to your comfy rooms, it is time to rejuvenate yourself discarding the accumulated tiredness. At present, spring cleaning is quite common scenario in commercial buildings and offices also. Though it is an old tradition, however, the actual idea behind the total program is to create a safe environment for all the residents. Be it workplace or home, individual spends a lot of time in close contact with the buildings. In order to become definite that no bacteria or infection is passed on, varieties of spring cleaning products are available in the marketplace. It is known to everybody that cleaning could take lot of time, energy and be a sturdy job also. Proper planning is the right solution to remove all these hurdles for undertaking the cleaning task in your home. First of all you should take a paper and pen in hand and try to focus on the areas where cleaning job is essential. You should not overlook anything and give a close look to storerooms to curtains to the furthermost cabinet corner of the kitchen and the HVAC system also. Preparing a checklist before, makes it sure that you have all the spring cleaning products ready near you while it is time to take mop in your hands after wearing the gloves. While doing the household cleaning job you can also make some relocation of furniture along with a bit of refurbishment. You would be surprised to see that lot of free spaces have been created along with a complete new look. Usually warm water could be utilized for the overall cleaning work, however, in some particular areas you may have to use spring cleaning solutions. At the time of utilizing disinfectants, you should apply it carefully since it may affect the environment in a negative manner and can create health hazards if not used properly. 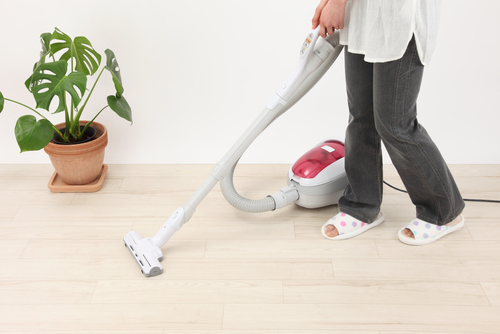 Maintaining and pursuing the process of spring cleaning is very simple. When your arrangement for cleaning products is ready and complete, it needs a day to have your house ready for the incoming long summers. Though spring cleaning is carried out at a particular time; you should make sure that your household cleaning is performed from time to time. A healthy home is the best way to a responsible and comfortable living. Spring Cleaning Made Easy with Eight Simple Ways to Breathe New Life into Your Home. Creating a list that details each room that needs attention (and what needs to be cleaned in each room) is the first step to ensuring that your home is as clean as possible from top to bottom. Give every member of the family their own list of items to clean. Turn the cleanup into a game by giving prizes (or other incentives) for different categories (e.g. "biggest helper" or "most attentive"). Set up a start time and establish expectations. Rooms like kitchens and bathrooms often require more cleaning than an office or sitting room. Instead of attempting to clean an entire room at a time, break down your list into realistic efforts. Planning to clean out and scrub the refrigerator, disinfect the countertops, clean out the pantry and cupboards, clean the stove inside and out and scrub the microwave can be an overwhelming to do list--especially if you plan to do it all at once. Spring is a great time to store away any items that you won't need in the non-wintery months. Scarves, boots, gloves, and snow shovels are just a few of the many items that can be put away for now. Just make sure you keep a sweater or jacket on hand for the occasional chilly evening. Using natural products is a much safer alternative to the usual roundup of toxic and poisonous cleaners. Not only are they gentler on your skin while cleaning, but they are also less threatening to children and pets. Spring cleaning is the perfect time to prepare your deck, patio, or backyard for the warmer months ahead. Stain the deck, clear the patio, or plant some new flowers and you'll be ready for guests when the weather heats up. One reason why clutter develops is because items have not been given an allotted space for storage. Provide a designated area for household items, children's shoes, cookbooks, etc. for when they are not in use. Plastic bins, durable metal shelving and wall hooks are all simple, low-cost solutions. 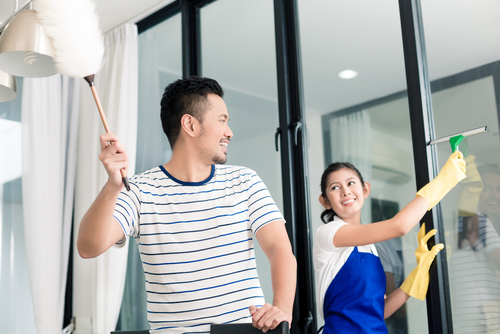 There are a lot of ways to stay on top of a clean home beyond the spring cleaning season and maintaining a clean home in the first place is probably the most effective. Tidying up once or twice a week is much less daunting than attempting to scour the entire house every season.